So many women get affected by Urinary Tract Infections (UTI) every year. According to UN data, at least 80% women in developing countries contract UTI at least once in their respective lifetime; a more than 50% of them get it twice. Imagine getting trouble at one of the most sensitive parts of your body. It’s irritating and scary to say the least. What’s amazing is that in 2 cases out of 3, UTI could have been avoided just with doses of a little care and hygiene. 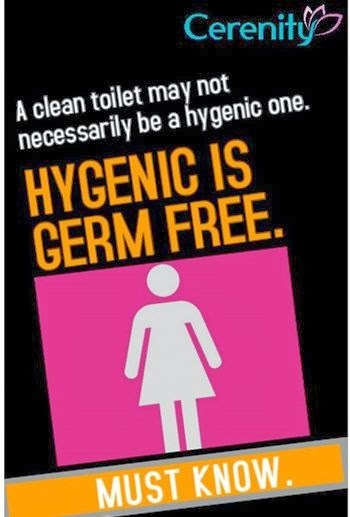 A major concern for women in third world countries like ours is unhygienic toilet seats. These unhygienic toilet seats come about not just because of poor upkeep and maintenance, but also because they are shared by many and not necessarily washed (including that of the toilet seat) after each usage. These toilet seats harbinger multiple germs and bacteria that could lead to Urinary Tract Infections (UTI), Diarrhoea, Gastroenteritis, Staph and Herpes etc. It’s a no brainer that a bulk of such shared (mostly by people unknown to each other) toilet seats are public toilets found on the streets, inside malls, offices, railway stations, airports et al. An average person visits the toilet at least 5-7 times a day, out of which 4-6 times are only to pee. Now, since women use the toilet seat with a greater degree of contact than men, their chances of contracting UTI and other infections rise manifold. In a recent survey done by CERA, a bathroom solutions major, an unhygienic toilet experience, insufficient water availability & bad smell were found to be the top 3 reasons for women not using toilets outside their homes. It’s important that we create enough awareness regarding the causes, symptoms and prevention of UTI. Here’s some information that you will find useful. What are the symptoms of urinary tract infections (UTI) ? Urinary tract infections are bacterial infections affecting both lower and upper urinary tract. Lower tract infections affects the bladder, with symptoms like painful urination and frequent urination (or urge to urinate). Upper tract infections affect the kidney, with symptoms like fever and flank pain. What are the symptoms of being infected with E. Coli ? Symptoms of E. Coli infection include severe abdominal cramps leading to diarrhoea and stools with blood. It causes sores in the intestines, besides nausea and vomiting. · Avoid toilet seats shared by too many people. · Always use tissue paper on top of toilet seats as far as possible. However the best solution is to deploy an optimum mix of all the three. Next week we will talk about the best practices while using public and other shared toilets.